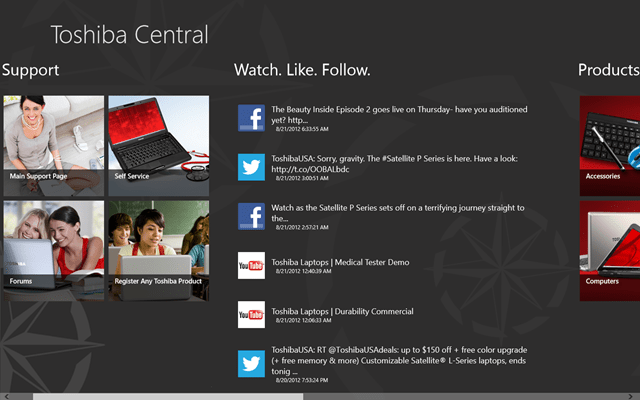 Toshiba Central is a free Windows 8 Technology App that lets you update yourself with all the latest technology in Toshiba. This app for Windows 8 provides you with the technical support and services straight form Toshiba. Toshiba Windows 8 app is quite easy to use and its just like using a browser which will let you connect to Toshiba directly. You just have to go through the tabs and instructions given on the Toshiba Central. Just go through the technology app for Windows 8 and you don’t have to switch on to your browser anymore for any Toshiba related query. In addition, you can also have a detailed search with this Windows 8 technology app by using the ‘View In Browser’ button. 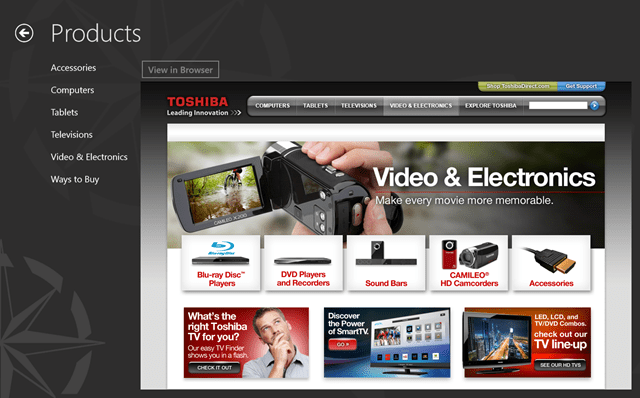 You can explore various Toshiba products, latest technologies by Toshiba and people review on the products. So, just get connected to your social network account and you can also post your reviews about Toshiba’s services and products. Or you can go check on YouTube to check on the latest videos related to Toshiba’s latest review or conference. You can also go through the amazing gadgets and products of Toshiba just through this Windows 8 technology app and can get all the specifications regarding those products. Just click on the Products section and find all the latest gadgets and electronics like tablets, televisions, accessories etc right on your interface. You can also register your product right through this app and can also purchase any product with the help of this Windows 8 app by going to the ‘Ways To Buy’ section. You can explore all kind of other stuffs related to Toshiba like the latest commercials, company history, corporate conferences, various press releases etc right on your fingertips. Just click on any of them and you will be directed to the webpage and you can also check it on your default browser. So, just download Toshiba Central app on your Windows 8 desktop, available under the “Tools” category of Windows 8 store and stay connected with Toshiba.